Thanks to the help of several of you, I managed to get my activity bot to be both RC controlled as well as autonomously search and avoid obstacles. It's pretty awesome. I was wondering though, is there a way for the propeller board to power four wheels? I see a lot of 4wd RC smart car kits out there, but they seem to all be for arduino. Are there any 4-motor motor shields for propeller? How do I use the propeller language to program these? Basically, I just wanted to convert my current robot program into a larger, more rugged off road type vehicle. Is this possible? Definitely possible to control 4 motors. Perhaps some of the robotics experts will chime in with details in a while. I don't recall seeing shield or add-on board that can drive 4 DC motors, but the Propeller can easily drive two separate dual motor controllers like the Parallax 28820 Dual Motor Driver or Pololu 1110 module. That would give you control of each motor easily. I looked at something similar for the two Inspection Robots I have on my workbench. One is a large platform (about 28" long with 8" wheels) and does have the ability for each wheel to be independently driven, so a similar solution with two of Parallax's DHB-10 boards was my plan so I can also leverage the onboard Props for additional horsepower. However,there are others on this forum with more solid experience driving multiple DC motors in collaboration and there may even be good code out there already. Hopefully somebody reads this thread and provides details. Right now my activity bot is able to ping and avoid obstacles and follow a drive routine to simulate "exploration". I basically was hoping for it to do the exact same thing, but in a more robust four-wheel drive chassis that I could drive outside. Is this possible? The short answer is it's definitely possible. I don't personally know how to program that project, but someone like Duane or Erco (that hang out in the robotics forum) probably does. You will need some kind of motor controller as stated above. Right now your Activity Board controls the servos acting as motors by simple pulses. But to have the same kind of control with a DC motor, you will most likely hook the motors to a small controller board, and that to the Activity Board. If you are using the latest WX version, maybe it's possible to run them directly from the Activity Board because it can do more amps, but someone else will have to confirm that. A small motor controller is inexpensive though. Most small controllers have input and output to control 2 motors, which should work fine. Does the 4WD R/C car actually have 4 motors? Most would only have one big motor with a drive shaft going up to the front axle from a transfer case, giving you 4WD much like a real life Jeep or truck. Sometimes they actually have 2 motors, one for each axle, but that's a more expensive way to do it. It would be extremely rare for it to have 4 motors, as in one for each wheel. I believe I have only seen one tank based bot like that. Four wheel drive rover kits are available, i bought mine through robotshop.com (site appears down at the moment, maybe they went belly up...). At the time the kit just included the motors, wheels, and the chassis. This bare bones approach gave me the flexibility to create my own monstrosity instead of shoehorning a propeller into an andrino based kit. The motor controller i used was pretty generic, from ebay i think. It handled the current efficiently, and allowed independent control of each wheel. To make this a practical setup though, i think you would need to add wheel encoders to the mix. I could never get her to roll straight, as each motor seemed to behave slightly differently. Note that in my setup I was not powering the motors through the prop as you alluded to in your original post. That doesn't sound like a good idea. Instead your motor control powers the motors. Your prop just needs to tell the motor controller which wheels to spin, in which direction, and how quickly. Good luck with your bot! Let us know how it works out. You could use something like the Ada fruit 16-channel i2C Server Controller and sync the Left and right wheels or run them independently using an i2C control signal. As regarding the motor drivers, I can't recommend one. However regarding an actual vehicle, do you have one chosen? I recall that Tamiya makes excellent ones. Interesting! 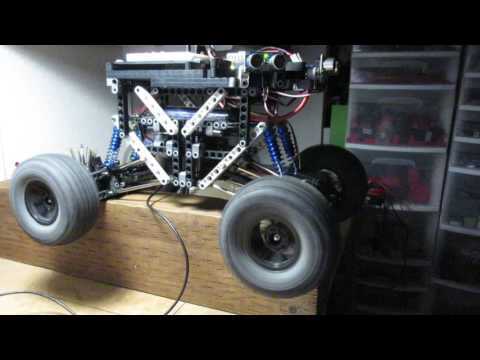 I was helping a buddy on installing the new tires and some forged wheels on his Dodge Ram when he mentioned about building 4 wheel drive rover RC project. This will be a great idea to start with. Definitely possible with a WX board but not sure about the coding, someone with more smarts will have to address that issue. I am thinking of making a 4wd BOE-Bot by connecting both right side servos together on my breadboard and same for left side, band running software as a 2wd vehicle. I am assuming that the same can be done with the DC Motors. Should be able to operate with Prop as well. I sent her a message to look at this thread! post here or email me at carolhaz391@gmail.com. I had done this project earlier with an Arduino, but now program it with Blocklyprop which is more fun! Thanks for this! You are the best! There are a lot of variables here. Adding two motors is probably the least of your problems. Any idea how big you want this to be? Also do you want something slow with lots of torque or something that goes fast? Do you have tools to fabricate anything? I am using two Parallax Small Robot Chassis bound together an inch apart. I really don't care about speed or torque, so much as a new idea. Only custom fabrication here is cardboard.